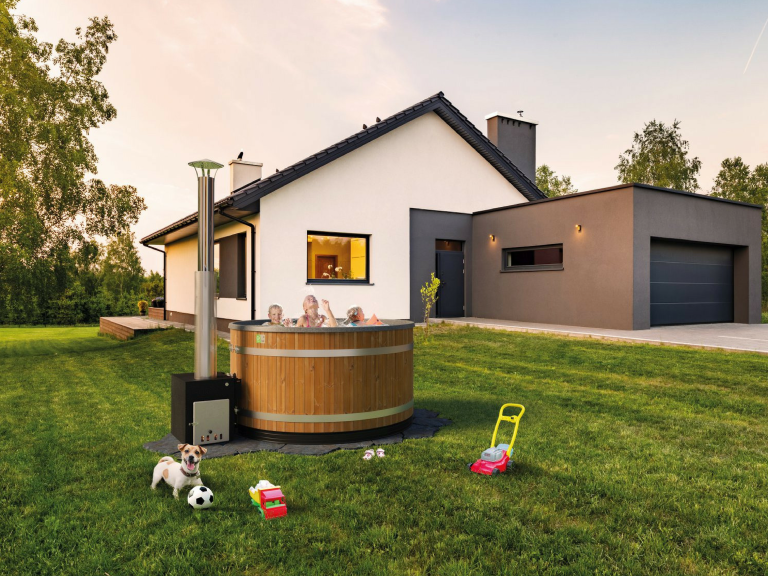 The water maintenance required by a hot tub depends on where the tub is used. At a summer cottage, where bathwater is often carried from the sea, a river or a lake, the water may be changed for each bath. This way, you will always have clean water, although the constant filling and emptying of the tub takes some effort. If you wish to bathe in the same water for 1–3 times, for example for the entire weekend, you should use some of the following options. For immediate disinfection effect use dissolving chlorine or active oxygen granules. Please note: Remember to mix the granules with a small amount of water before putting them into the tub. Active oxygen or multi-function tablets can be used for permanent disinfection. Please note: Do not place the tablets directly into the tub. Instead, they need to be placed in a dispenser where they will float into all parts of the tub along the water. Don’t forget to remove the dispenser from the water for the duration of the bath. If you need to fill your tub with tap water or well water, it will be worth it to invest in thorough water hygiene. When the water is maintained properly, it will remain clean and pleasant for a long time, even throughout the summer. This type of water maintenance is not very complicated, either. Kirami recommends using a filter system and chemicals either with or without chlorine. If there are multiple bathers or if the tub is in public use, we strongly recommend the option with chlorine. Bathwater maintenance consists of two areas: mechanical sanitation with a filter and chemical cleansing with cleaning agents. A filter in the tub removes loose dirt from the water, and the cleaning chemicals mixed into the water remove bacteria and algae. When purchasing the chemicals, you need to decide if you want to clean your tub with chlorine or active oxygen. Chlorine is a common cleaning agent used in places such as public swimming pools because of its powerful and long-lasting effect. First, you need to ensure that the pH value of the bathwater is at a correct level so that the cleaning chemicals will work in the best possible manner and that heater won’t be corroded. 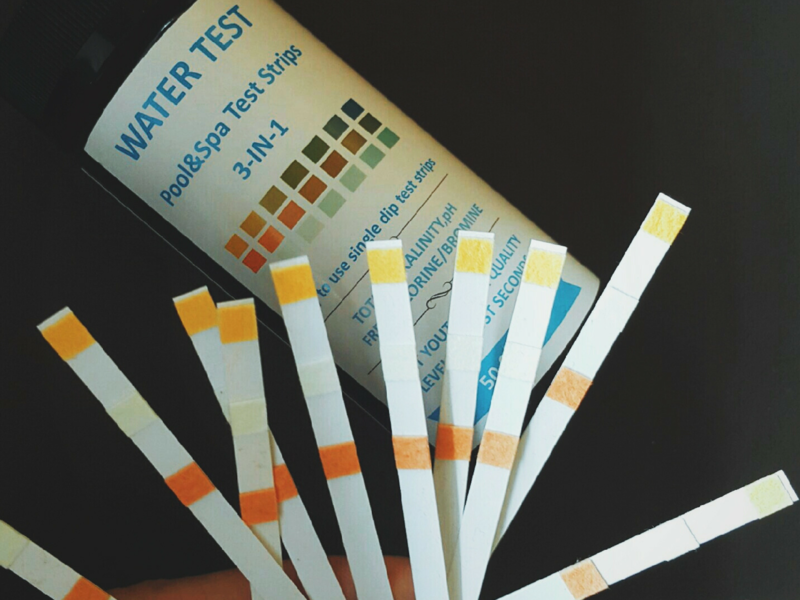 Using pH test strips is the easiest way to check the pH value. A strip is dipped into the tub, after which you can compare the colour of the strip to the colours on the can. A more precise pH measurement can be made with a pH tester than can also be used to check the oxygen content and the amount of free chlorine in the water. The testing tablets are placed in the compartments of the tester, and water is scooped from the tub into the test box. As the tablets dissolve, they dye the water in the tester. The scale on the side of the tester shows which colour corresponds to which pH value. The ideal pH value is 7.0–7.4. If the pH value is under the ideal level, pH+ granules, in the amount specified in the instructions, are first added into the bathwater, taken from the tub, in a separate bucket. Once the granules have dissolved, the water in the bucket is poured back into the tub. If the pH value is too high, the same procedure is performed using the pH- granules. Once the pH level is ideal, the tub can be cleaned. First, the water is subjected to shock treatment, after which the cleanliness level of the water can be maintained with a maintenance dosage. Despite its dramatic name, shock treatment only means that a cleaning tablet is placed in a floating dispenser where it dissolves in the water. Maintenance is done following the same procedure, only in a smaller dosage. As mentioned at the beginning of the article, you can keep your tub filled with seawater or lake water clean for the next weekend using a single tablet. The treatment in question is the shock treatment described above, and it can be done with either chlorine or active oxygen. In a nutshell: keeping your bathwater clean and pleasant only requires a few steps. First, you measure the condition of the water, and then you improve it with pH granules and cleaning tablets. We wish you pleasant baths in clean and hygienic water!